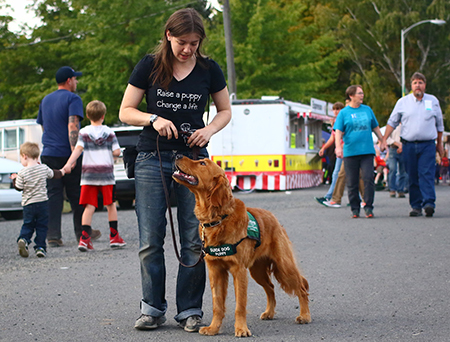 Katherine Martucci and 9-month-old male Golden Retriever Casper. The first puppy that she and Amanda Amore raised, Casper is a beloved pet in Pullman with a new name, Taji. Photographs taken by Amore and Martucci of local puppies in training and working guides for Guide Dogs for the Blind will be on display through mid-May at the Animal Health Library in Wegner Hall 170, part of the twice-yearly “Art in the Library” program. Exhibits feature animal-themed works, typically from artists with a connection to the WSU College of Veterinary Medicine. For more information, visit http://www.vetmed.wsu.edu/news/art. Golden retriever Fairview, shown when he was 6 months old, is still in training with Amanda Amore and Katherine Martucci. Martucci, who graduated from WSU with her DVM last May and works as an emergency veterinarian in Seattle, said a lot of hard work goes into “shaping these little bundles of puppy fluff into focused, motivated and highly skilled canine partners.” The process requires not only the joint efforts of the puppy raisers and trainers, but also the support of their communities. The exhibit is a way to celebrate the people, puppies and places that Amore and Martucci have encountered as volunteers. “Raising a service dog puppy is a long journey filled with countless priceless memories,” Martucci said. “You go everywhere together, rejoice in every puppy milestone, resolve yourself at every setback, scrutinize every little behavior and do your best to help that puppy reach their highest potential. “When visitors see these photos, I hope they see the incredible bond between puppy and raiser, that they catch a glimpse of this puppy-raising journey, appreciate its greater purpose and are possibly inspired to start their own,” she said. 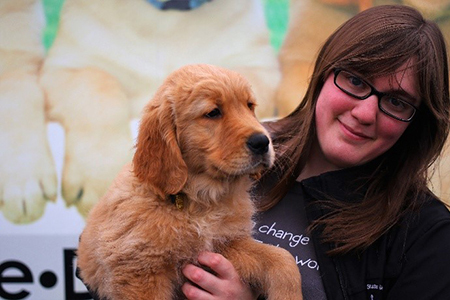 Amanda Amore with 10-week-old male Golden Retriever Midas. He is now in formal guide dog training in Boring, Ore.
Amore said she also hopes the exhibit will foster an understanding of the etiquette surrounding handlers and their puppies in training or working dogs. For example, when you encounter them in public spaces, don’t smile, bend down to or make deliberate eye contact with the dog. Focus on the human instead. If exhibit visitors are inspired to help the nonprofit organization that connects people and guide dogs, any action big or small helps. Guide Dogs for the Blind provides support to its clients and doesn’t charge anything for its services. Support consists of veterinary financial assistance, field service support and an alumni association. The organization does not receive any government funding, relying on the generosity of donors. For more information about volunteering for or donations to Guide Dogs for the Blind, visit http://www.guidedogs.com. For information about the local club Guiding Paws of the Palouse, visit http://guidingpawsofthepalouse.weebly.com.